SULLIVAN COUNTY, NY (March 16, 2015) – March is New York State Maple Syrup Month, a time when the sap is flowing from the trees and the sweet smell of maple syrup is coming from the sugarhouses. As part of a buy local effort, Cornell Cooperative Extension Sullivan County (CCESC), along with our partners Catskill Mountainkeeper, the County of Sullivan and Sullivan Renaissance, have joined to promote the use of Sullivan County maple syrup. “On the Move for Maple Syrup” is a campaign that aims to promote the use of Sullivan County maple syrup by connecting Sullivan County maple producers to eateries and other retail establishments. The campaign also raises awareness about the benefits of local maple syrup and is supported by the County of Sullivan through a legislative resolution. As part of the campaign, CCESC has created a “Sullivan County Catskill Maple Syrup Directory”. The directory contains educational information about maple syrup production, nutritional information and a list of current maple producers in Sullivan County. Maple syrup production is a growing industry in Sullivan County and contributes to our overall economic and environmental health. Purchasing local maple syrup helps to support our farms, forests and local economy. Maple syrup also tastes great and is good for you too! It has no additives, no added coloring and no preservatives. The New York State Maple Producers Association invites families from across NYS and neighboring areas to learn about the production of maple syrup and other related products. Their goal during Maple Weekend is to share the taste of real mouth-watering maple syrup with you. 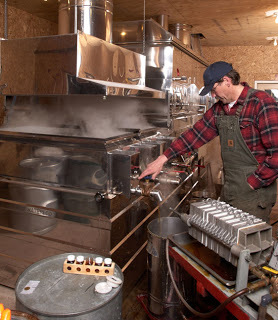 Maple producers will demonstrate how to make syrup — whether it’s simply boiling the sap over an open fire or running it through highly scientific equipment — the results always taste great! The 2015 NYS Maple Weekends are March 21-22 and March 28-29. Visit www.nysmaple.com to learn which Sullivan County maple producers participate in the NYS Maple Weekend. To get your own copy of the directory, stop by the CCESC office located at 64 Ferndale Loomis Road, Liberty, NY, the Sullivan County Visitor’s Association or any of the partner offices. An electronic version of the directory can be downloaded from the CCESC website at www.sullivancce.org. To learn more about the Maple Syrup Directory, or to be listed in the next edition contact Cornell Cooperative Extension Sullivan County (CCESC) at 845-292-6180, or by emailing sullivan@cornell.edu. To learn more about the On the Move for Maple Syrup Campaign and how you can get involved please contact Sullivan Renaissance at 845-295-2445. GRAHAMSVILLE, NY – The public is invited to a Maple Weekend Tour at the Catskill Mountain Sugar House in Grahamsville, NY on Sunday, March 22 from 2:00 to 3:30 p.m. The tour will be followed by a short hike or snowshoe, depending on conditions, around the mountaintop farm. Participants will meet at the Catskill Mountain Sugar House at2:00pm, located on 227 Glade Hill Road in Grahamsville, NY, to witness tree tapping and sap boiling at the site of Sullivan County’s only organic maple syrup producer. The group will then hike the property nestled in the Catskill Mountains to finish off the day. Reservations are required before Sunday, March 22 at 11:00 a.m. by calling Lisa at 845-439-5507 or emailing info@morgan-outdoors.com. If trail conditions call for snowshoes, rentals for this special event are just $5. Snowshoe reservations and driving directions can be obtained with RSVP. Sponsored by Trailkeeper.org, with experienced staff from Trailkeeper.org partners: Lisa Lyons of Morgan Outdoors and Erin Burch of Catskill Mountainkeeper. Trailkeeper.org is a partnership of local organizations, businesses, and agencies to promote the public trails and natural beauty of Sullivan County, NY, including: Catskill Mountainkeeper, Cornell Cooperative Extension Sullivan County, Delaware Highlands Conservancy, Sullivan County Division of Planning and Environmental Management, Sullivan Renaissance, Sullivan County Visitors Association, and Morgan Outdoors.